In June and July 1915 the British captured Amara and Nasiriyah in Mesopotamia. The force that did so was nicknamed Townshend’s Regatta because most of the troops of Major-General Charles Townshend’s 6th (Poona) Division of the Indian Army travelled along the Euphrates and Tigris in a flotilla of various types of ship and boat. The British had landed troops at Basra in November 1914 in order to protect their interests in the region, notably but not only the Anglo-Persian Oil Company’s refinery at Abadan and the pipeline to its Persian oilfields. The capture of Amara and Nasiriyah meant that the oil facilities and the vilayet (province) of Basra were securely held and the British should then have halted. Townshend and his division were, however, ordered to advance on Kut-al-Amara, with the intention of taking Baghdad. He argued in his memoirs that this operation should not have taken place. Basra vilayet and the oilfields should have been defended by a force based at Basra, with outposts at Qurna, Nasiriyah and Ahwaz. He was right, but the campaign continued for a number of reasons: the need for a victory somewhere after defeats elsewhere; over confidence by local commanders; and momentum created by a series of easy victories early in the campaign. The need for re-fits and the fact that the larger ships could not move any further up the Tigris meant that the naval force was reduced to the armed tug Comet, the armed launches Shaitan and Sumana and four horse boats carrying 4.7 inch guns towed by the motor launches RN 1 and RN 2. Captain Wilfrid Nunn, the Senior Naval Officer, and his successor, Captain Colin Mackenzie, were both ill, so Lieutenant-Commander Edgar Cookson of the Comet took over. The horse boats were so called because they had no engines and were normally towed by horses walking along the river or canal bank. The 4.7 inch guns were elderly, but the launches and horse boats had very shallow draughts, so could provide fire support for the troops in waters too shallow for the sloops that had provided this earlier in the campaign. RN 1 was commanded by Leading Seaman Thompson, a veteran, and RN 2 by Able Seaman Phil Gunn, a young sailor who would later be commissioned and rise to the rank of Captain: the rest of their crews were Indians. RN 1 and RN 2 were protected against sniper fire by steel plates around their cabins and engine rooms. Phil Gunn’s RN 2 would lead the advance of the whole expedition. The advance began on 12 September, with the troops moving to Ali-al-Gharbi by ship. From then on, the shallow water meant that the troops had to march along the river bank, with the shallow draught tug, launches and horse boats providing fire support. The Ottomans withdrew without offering any resistance and the British force halted at Sanniaiyat from 15-25 September, during when it received reinforcements. The temperature was 110-16° F in the shade, of which there was little. The engines of the aircraft that had operated in Mesopotamia so far had proved to be unsuitable for the hot, dusty atmosphere: 70 hp Renault ones in the Maurice Farmans and 80 hp Gnomes in the Caudrons and Martinsydes. In early September three Royal Naval Air Service Short seaplanes with 150 hp Sunbeam engines under the command of Squadron-Commander R. Gordon arrived from Africa, where they had been involved in the operation that resulted in the destruction of the light cruiser SMS Königsberg. Their climbing ability was poor and it was difficult to get a long enough take off run on the Tigris. Two had their floats replaced to allow them to operate from land, thereafter giving good service despite engine problems. Aerial and naval reconnaissance discovered that Nureddin Pasha’s Ottoman troops were dug in astride the river in a strong defensive position 8 miles from Sannaiyat and 7 miles from Kut. There were two Ottoman divisions with 38 guns plus two cavalry regiments and 400 camelry. Most of the mounted troops were away on a raid and missed the battle of 28 September. The Ottoman divisions had only six battalions each, meaning that they were outnumbered by the 14 British battalions. Some of the Ottoman guns were obsolete, giving the British an small artillery advantage. Townshend decided to divide his force into two columns. Column A would demonstrate against the Ottoman troops on the south bank of the Tigris. Column B, its flank protected by the naval flotilla, would attack on the right bank in order to pin the enemy’s centre. Column A would then cross the river and attack the enemy’s left flank. A boat bridge was laid across the river on 27 September. Column B advanced to within 2,000 yards of the enemy, whilst Column A demonstrated during the day before crossing the river under the cover of darkness. It was ready to attack by 5:00 am, with Column B advancing at the same time. The Ottomans advanced on the south bank at 11:00 am in order to enfilade Column B, but were thrown back by fire from the naval 4.7 inch guns and army 4 and 5 inch guns. The gunboats had moved forward at 11:00 am to engage Suffra Mound, which was taken by Column B by 2:00 pm. The boats came under shell and rifle fire, but the Ottoman artillery was largely silenced by the afternoon. Contact between the two columns was maintained by the aeroplanes and seaplanes, as the strong wind created clouds of dust that made visual signalling between the columns impossible. At 4:50 pm Column A began to advance on the rear of the enemy facing Column B. Enemy reinforcements appeared 40 minutes later, but Brigadier-General W. S. Delamain re-deployed his troops to face them. A bayonet charge routed the Ottomans, who escaped under the cover of darkness, suffering heavy casualties and leaving four guns behind. At 6:00 pm the naval flotilla heard of Delamain’s success from a seaplane. Townshend asked Cookson to advance to an obstruction that blocked the river in the hope of destroying it and allowing a pursuit by water and land. The flotilla set off after dark at 6:30 pm, coming under heavy rifle and machine gun fire, as they approached the obstruction, which consisted of a dhow in the centre, attached by wire hawsers to two iron lighters. An attempt to ram the dhow failed, so Cookson jumped on it in an attempt to cut the hawsers with an axe. He quickly suffered several bullet wounds and died 10 minutes later. The flotilla then withdrew. The flotilla, now commanded by Lieutenant Mark Singleton of the Shaitan, resumed its advance the next morning, 29 September. The Ottomans had retreated from the obstruction and the British vessels reached Kut at 10:00 am. 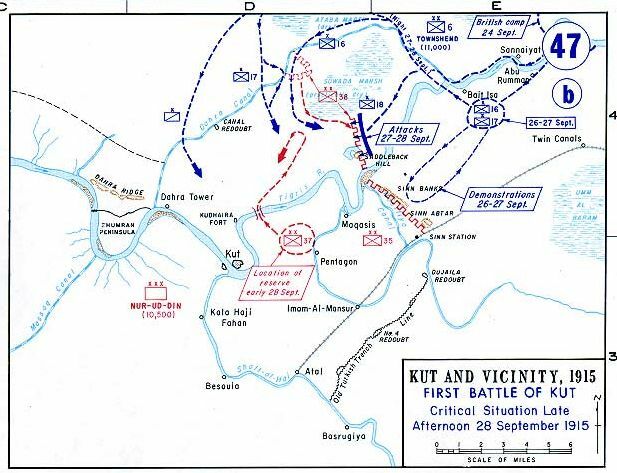 The low level of the river made navigation difficult, but they continued past Kut. On 30 September they encountered two armed Ottoman vessels, the Poineer and Basra. Sumana and Shaitan had both run aground, the former breaking both rudders, so the Comet engaged the two enemy steamers herself before being joined by the Shaitan. The Basra was damaged and withdrew. The British pursued, but then came under fire from shore based guns astern of them. The Shaitan ran aground again and there was a risk that she and the Comet would be cut off, but the Shaitan managed to re-float herself and the British retired to Kut. The difficulty of conducting a pursuit when the only means of transporting heavy equipment was along a low river meant that the Ottomans were able to withdraw to a prepared position at Ctesiphon. On the 28th September, 1915, the river gunboat “Comet” had been ordered with other gunboats to examine and, if possible, destroy an obstruction placed across the river by the Turks. When the gunboats were approaching the obstruction a very heavy rifle and machine gun fire was opened on them from both banks. An attempt to sink the centre dhow of the obstruction by gunfire having failed, Lieutenant-Commander Cookson ordered the “Comet” to be placed alongside, and himself jumped on to the dhow with an axe and tried to cut the wire hawsers connecting it with the two other craft forming the obstruction. He was immediately shot in several places and died within a very few minutes. C. V. F. Townshend, My Campaign in Mesopotamia (London: T. Butterworth Ltd, 1920), pp. 35-36. Naval Staff Monograph (Historical) 1921 vol. iv, Naval Operations in Mesopotamia and the Persian Gulf. pp. 75-76. D. Gunn, Sailor in the Desert: The Adventures of Phillip Gunn, DSM, RN in the Mesopotamia Campaign, 1915 (Barnsley: Pen & Sword Maritime, 2013). Kindle edition, locations 812-22, Chapter 22. This well researched book, by Phil’s son David, gives an excellent description of the Mesopotamian Campaign from the viewpoint of one of the RN’s lower deck. Ibid. Kindle locations 1067-79, Chapter 28. Naval Staff vol. iv. p. 76. J. S. Corbett, H. Newbolt, Naval Operations, 5 vols. (London: HMSO, 1938). vol. iii, p. 192. Naval Staff vol. iv. p. 77. Corbett, Newbolt, Naval. vol. iii, p. 195 and footnote 2. Naval Staff vol. iv. p. 78. Footnote 1. And as a result more men die or are wounded – men who should have survived. Good summing up of the situation. Thanks. what is it that you set out to do? This is part of a series about the Royal Navy in the First World War. It played a significant role in the Iraq campaign because of the importance of the Euphrates and Tigris as transport routes. I started off intending to blog about the history of war and current national security issues, but have found myself writing much more about the former as the blog has developed. Thanks for the kind words. I think that your website is extremely good, with a huge amount of information. I have sometimes linked to it from my blog, notably to casualty lists and medal citations. Thanks. I’m now following your blog.